[Stride]-Stride Step-[Choose one or more cards with the sum of their grades being 3 or greater from your hand, and discard them] Stride this card on your (VC) from face down. [ACT](VC)[1/Turn] Generation Break 2:[Counter Blast (2) & Choose a card from your hand, and discard it] Choose cards from your drop zone up to the same number of rear-guards you have, call them to separate (RC), for each called unit that has the hollow ability, your opponent chooses one of his or her rear-guards, and retires it. If your opponent has no rear-guards, draw a card. Everything is getting to retire now, I mean what the hell? 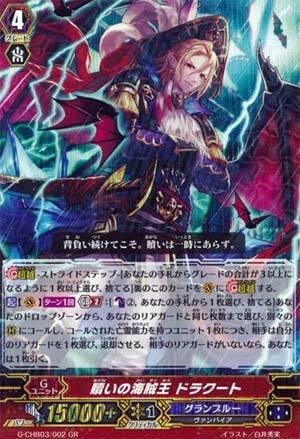 Dragut's GB2 ACT is once per turn, and costs CB2 and a discard from the hand. For every rear-guard you have, revive that many units from the drop. For every one with Hollow you revive, retire an enemy rear-guard. If the opponent is left with no rear-guards, draw a card. So, if you have a full board in play, you can sack them off to completely boardwipe anything without Resist. Of course you probably won't given how Hollow and Seven Seas works, but anything that is going to +2 you even in the worst case scenario is pretty good. I'm not even mad that any other GR card like Wailing Thavas can also boardwipe while getting something else off, because that's balanced out by how much setup they need beforehand, as opposed to Granblue who don't. Being able to proc Mick the Ghostie multiple times and recoup with Grenache makes this pretty nutty. That's not even counting the field ruining.